Last month, a Marine veteran said goodbye to his canine companion, Cena, who was suffering from bone cancer. Giving Cena one last ride became a community event that Lance Corporal Jeff DeYoung hopes will help raise the profile of the dogs that serve the military, and why they deserve care. These are the introductory words to this video, another excellent one sponsored by the Kleenex brand. Andi is a little girl with Down’s Syndrome and Barley is her assistance dog who has been trained by Canine Companions for Independence. This book will make you want to go out and adopt a Greyhound! 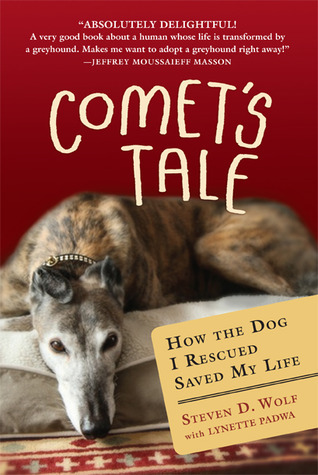 Mr Wolf tells the story of Comet, a Greyhound who comes into his life as his health and well-being are seriously under threat. The author never had any experience with Greyhounds until he is drawn to a charitable group promoting Greyhound adoption at his local supermarket. A Greyhound who suffered abuse at the track, Comet is withdrawn around most people but decides that Mr Wolf (affectionately called “Wolfie” by his wife) is for her. She literally sits down next to him and lets him know – take me home. As Steven’s health deteriorates, he lives on pain killers and can barely walk or do simple household tasks. This is when he decides that Comet has all of the qualities of a service dog and only needs training. He looks for trainers to assist him and all scoff at the suggestion that a Greyhound could be a service dog. So, he trains her himself. I particularly liked the stories of Comet as she learns to pull Steven’s wheelchair through the airport. Aided by the photo on the cover of the book (the only photo in this book, which perhaps is its only shortcoming), you can understand when Steven describes Comet’s doe eyes and the looks she would give him to communicate her very articulate thoughts! I recommend this book for summer reading (if you are currently in the Northern Hemisphere) or curl up with it in front of the fire for winter entertainment (if you are in the Southern Hemisphere). International Assistance Dog Week runs from 5-11 August this year. The IADW website contains information on events near you (primarily in the USA) but hopefully my home country of New Zealand will join in next year. What dog assistance charities do you support?